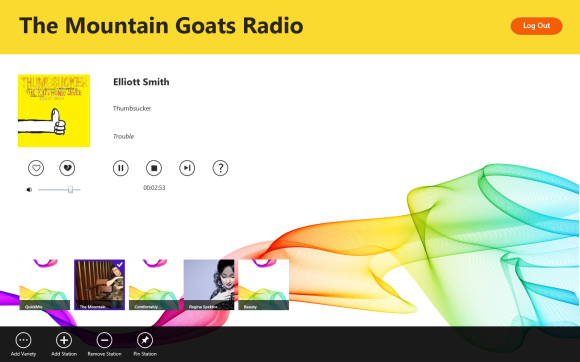 The touch-friendly modern UI at the core of Windows 8 looks and feels like no Windows that’s come before, but for music lovers, the question is how does it sound? 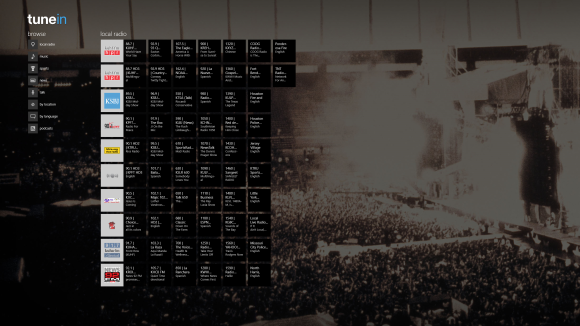 This early into the life cycle of the Windows Store, the best music apps—as with any other genre—are going to be the ones that tap into services that were robust long before the first Live Tile crossed a desktop monitor. Here are some of the best music apps we’ve found for the Metro interface. 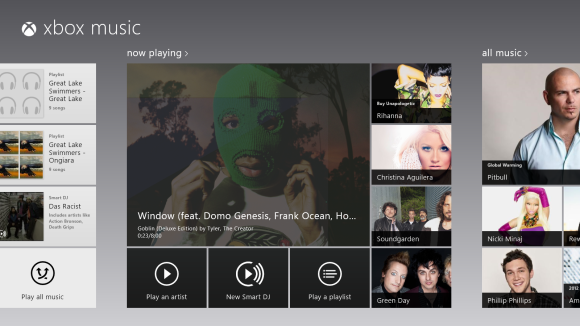 Xbox Music: Microsoft's slick native music player. Every operating system needs a dedicated music app, and Windows 8 keeps things simple by naming its modern-style music app, well, the Music app. Check out our Deep Dive into the Music appfor a full breakdown on all its new features, but in a nutshell: the app is pretty good. In addition to full access to whatever it finds in your Music Library and the ability to download digital tunes from a vast library of songs (for an iTunes-esque fee, of course), the Music app gives Windows 8 or RT users free, ad-supported access to Xbox Music Pass, which lets you stream more than 18 million songs on-demand or listen to a surprisingly decent Smart DJ mode, which offers dynamic playlists in a manner similar to Pandora or Slacker. After 6 months, free Music Pass subscribers are limited to 10 hours of gratis listening per month unless they pony up a $10 per month subscription, which also removes the ads. Slacker was streaming music to Windows 8 users even before the Music app. 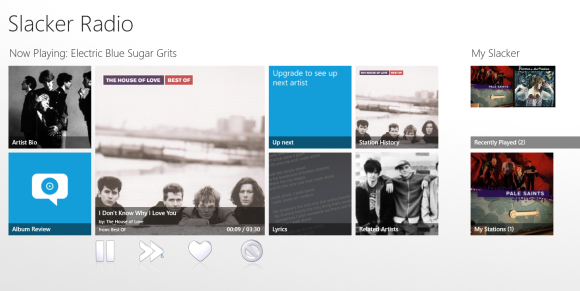 Slacker is a lot like Pandora, albeit without Pandora’s Music Genome Project and witha much larger catalogue of tunes. Slacker listeners can jam to a variety of pre-populated stations or create their own by identifying specific artists and choosing how much new, similar-sounding music you want to be exposed to on that station. Free accounts have occasional ads and limit the number of times you can skip songs to six per hour. Upgrading to a $4 per month subscription gets rid of ads and gives you unlimited skips, while a $10 per month subscription unlocks on-demand listening, which lets you play specific songs, albums, or artists and create your own playlists. All of Slacker’s useful settings—including the log in—are buried in the Charms bar, so navigating the app can be confusing if you forget about the hidden menu (like I frequently do), but the app itself is decent. TuneIn Radio is hard to tune out once you've tried it. TuneIn Radio lets you, well, tune into thousands of radio stations from across the world, from public radio to streaming-only stations. When you launch the app you’re greeted with your local stations, but you can drill down and sort by genre, language, location—want to know what they listen to in Snow Hill Station, Antarctica?— and more. The TuneIn Radio app even includes a podcast directory. Search is integrated into the Charms bar, as is logging in to your TuneIn account, and you can easily pin stations to the Start menu. The Windows media keys on your keyboard work with the app as well. TuneIn is easily one of the better music apps I've played with in the Windows Store. Sorry, foreign listeners, iHeartRadio is U.S. only. If TuneIn is chaos, iHeartRadio is order. It’s another internet radio streaming service, but this one’s owned by The Man. (Clear Channel, to be precise.) Like TuneIn, iHeartRadio lets you listen to terrestrial radio station streams—mostly from Clear Channel-owned US stations—but it also has several stations exclusive to iHeartRadio, including rotating holiday stations, “Chillax,” and a workout station. 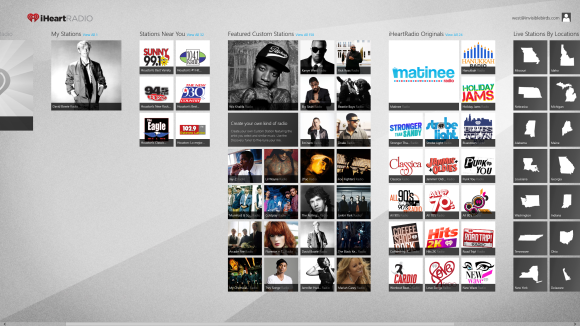 Users who log in can access custom artist stations, like on Slacker. One downside of iHeartRadio is that you can only access it from the US (or with a US-based proxy, if you're tricky). Thanks a lot, The Man. Like Slacker, you have a limited number of skips per hour in custom stations. You can search iHeartRadio for specific artists or tracks, but as with Pandora, you can’t actually play them. Instead, you launch a station based on that song. Searching for Mountain Goats songs and clicking “Counterfeit Florida Plates,” for example, launched a station playing Mountain Goats and similar artists, but it started with a different song. PRadio is Pandora radio, but not from Pandora. Speaking of Pandora, the granddaddy of streaming music services doesn’t yet have an official app in the Windows Store, but PRadio is a great consolation prize. The free, ad-supported app lets you log in to your Pandora account and gives you full access to your saved and carefully tweaked stations. PRadio allows you to like or dislike specific tracks if you want to continue crafting your stations; you can even modify existing stations or create new ones all together. The Windows 8 app works well pinned to the side of your screen and supports Windows Audio Controls. PRadio is by far the best way to listen to Pandora stations in the modern UI. Pinning Rdio to the Start menu. What if you want to listen to a service that has yet to introduce a dedicated Windows 8 app? 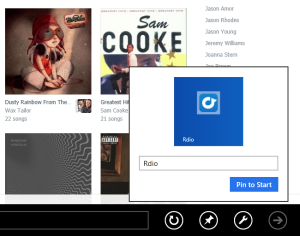 Pandora and Rdio can be played in the Metro version of Internet Explorer, although the interface for each shrinks down to unusable sizes when docked to the side of the screen and each stops playing when the page loses focus. MOG’s web client won't play in the Metro version of Internet Explorer at all. Spotify doesn’t have a web client or a Windows 8 app, so the desktop program is your only choice there. (That's the sound of a Surface tablet owner's heart breaking.) In fact, the desktop client is your best bet for Rdio, MOG, and Spotify. Pandora's web interface translates to Windows 8 nicely, however. If you insist on using the modern UI version of Internet Explorer 10—if you’re on a Windows RT device without access to legacy desktop programs, for example—you can pin a shortcut to the web interface of your chosen music service directly to your Start menu. Just open the website in-browser, select the Pin icon to the right of the address bar, and then click “Pin to Start.” That being said, given the issues that spring up when streaming music through IE10, I recommend using a dedicated Windows 8 music app or a classic-style desktop program if it's possible. This story, "Ear candy! The best Windows 8 music apps" was originally published by PCWorld.